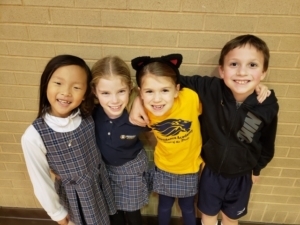 As an independent Christian school, Providence Academy’s mission to provide “Uncompromising excellence in educating and equipping students with truth” remains paramount. We know the value of proper training and preparation and understand that a school must offer a measured balance between academic rigor and character education. But I believe the proper balance can only be achieved if the school employs teachers who can inspire. It has been said that a poor teacher tells, a good teacher explains, an outstanding teacher shows, but the great teacher inspires. If a teacher can ignite in his or her students a genuine love of learning, as well as an understanding of the great truths of life, those students have the potential to achieve some form of greatness—not only for “self,” but for others who will benefit from their intellect, abilities and example. In my more than 30 years in the business of Christian schooling, I have also come to know and appreciate the value of integrating the tenants of our faith with the core subjects we teach. I have witnessed the power of shaping character in and out of the classroom. The mentoring relationships between teacher and student, coach and athlete, director and actor or musician on the stage are vital if a school is to achieve excellence in the various disciplines it offers. In short, great teachers are like great gardeners who prune, cultivate, and water the vine. They know their work requires patience and attention to the smallest detail. But they also know that discipline and careful pruning, while difficult at times, will produce lasting fruit. At Providence Academy, we strive to inspire, challenge and motivate students to find their respective passions and furnish them with the structure, framework, facilities, and faculty who can provide the nurture, training, and discipline that will enable them to be successful. We welcome you to explore how we endeavor to provide an “exceptional educational experience.” In doing so, we trust that your family will discover what makes the Providence community worthy of your consideration. The School Board is the primary governing body of the School and is responsible for the establishment of policy, the appointment of the Head of School, the appointment of the Spiritual Head of School, and the preservation of the School’s mission, finances, facilities, and programs. Providence Academy’s School Board is an all-volunteer body. No member is compensated for his or her service. Pursuant to Providence Academy’s Bylaws, there may be five (5) and not more than twenty-one (21) members of the School Board.